After its bleak yet brilliant series finale, you probably thought you’d seen the last of Breaking Bad and its motley crew of characters (save Saul, who got a spinoff). But there’s good news for the fandom today — Breaking Bad creator Vince Gilligan reportedly has a movie based on the series in the works. Wait, what? But, how… and who?! Could Walter White somehow be resurrected? We want details. Unfortunately, details are not exactly forthcoming at this point. We do know a few things, however. New Mexico Film Office director Nick Maniatis announced on Tuesday that a feature with the working title Greenbrier would begin filming, primarily in Albuquerque, in mid-November and wrap in early 2019. The movie, which will reportedly be two hours in length, will be produced by Sony Studios. 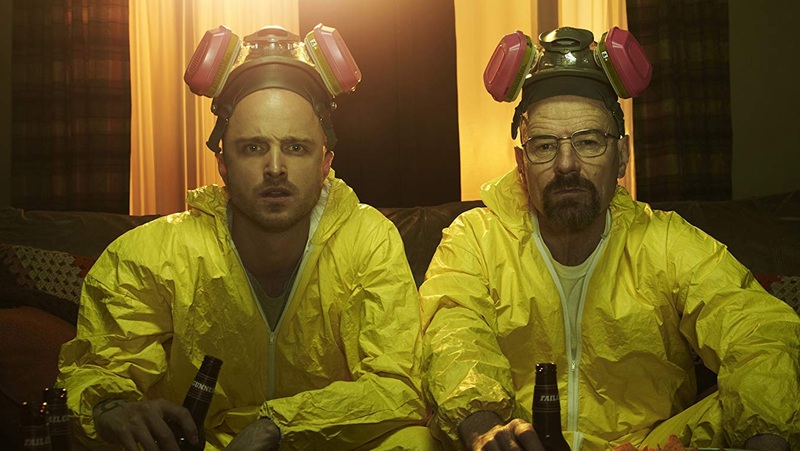 Per a release from the New Mexico Film Office, the movie will “track the escape of a kidnapped man and his quest for freedom.” According to the Albuquerque Journal, there has been no official confirmation the film is in fact connected to the wildly popular Breaking Bad. That certainly seems to be the prevailing thought, though. Based on the description, it doesn’t seem like a stretch to imagine that Aaron Paul’s Jesse Pinkman could play a prominent part in the movie. When all was said and done, it was impossible not to feel both sorry for Jesse for everything that had gone down and happy for his newfound freedom. Per IMDb, Paul has three movies currently in postproduction and a television series slated to air in 2019. So, arguably, he would have time in his schedule now to film a Breaking Bad movie. Anna Gunn, who played White’s wife Skyler in Breaking Bad, appears to also have an opening in her schedule that could coincide with filming. Naturally, the biggest question mark is Bryan Cranston’s Walter White. If you tuned into the original finale of the AMC series, you undoubtedly know that it would be pretty difficult for the character to return given how the finale ended. However, stranger things have happened in film. A movie could introduce a surprise twist to the series’ end that viewers weren’t privy to. Or it could explore an unseen storyline that happened chronologically prior to the series’ end. Cranston will be busy with the Broadway run of Network until mid-March 2019, with an eight-show-per-week schedule until the new year. In the new year, the schedule will slow down a bit — arguably giving Cranston a tiny margin of time to film at least a cameo in Greenbrier. Sadly, though, Cranston recently weighed in about returning to the Breaking Bad universe, and it didn’t exactly inspire optimism. “We’re all really proud of our show and Better Call Saul, and I think in some ways, it’s best to leave it alone. You want to think back on it favorably and say, ‘I don’t want to mess with it.’ It was a perfect opportunity for all of us. It changed all of our lives, and this man on the end here [Vince Gilligan] … He changed our lives for the better, and he is a brilliant storyteller,” Cranston told the crowd during Breaking Bad’s 10-year anniversary panel at San Diego Comic-Con in July.